Recently, eight of the women being rehabilitated by the Women At Risk project that Mocha Club supports in Nazaret, Ethiopia received diplomas for skills training in catering and food preparation. The 3-month training took a lot of hard work and commitment but it has been a success! Out of the eight women who graduated, two of them were set up in a small tea house that they could run together. They serve the customers homemade bread, tea, and soft drink. The daily average sales are around 75.00 Ethiopian Birr which is an average income to sustain their business (about $5.57 USD!). Another woman was set up with a vegetable stand to sell different kinds of vegetables, fruit, eggs, and firewood. Her daily average sales are around 50.00 Ethiopian Birr, which is also an average income to sustain her business. The other five women joined an existing café that was struggling. Sisters Café opened two years ago but has struggled in their administration and production. Out of the previous owners, only three were remaining, and they were more than happy to have the new group of five women join them, and this has increased the capital and capacity of the café. Re-organized and registered as a “micro-enterprise” by the local city authority, the café was opened on December 30, 2009. 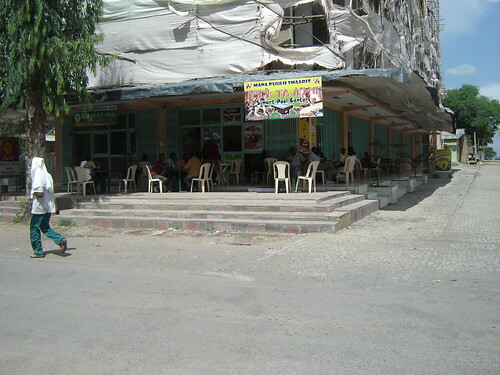 At its current location, it has the capacity to serve 45 people. During their skills training time, the women were also trained in extra skills necessary to run their businesses such as bookkeeping, purchasing, store keeping, money and time management and kitchen management. Now, all the women in the café are working hard. The daily average income of the café is about 1,500.00 Ethiopian Birr, and increasing. As their sales increase, the women are encouraged to work harder, since the income is theirs. Alemaze is one of the women working in the café. She is 26 years old. In the café she works as a waitress. Every morning she is responsible to clean the café, arrange the chairs and tables to serve their costumers. She is very happy to be one of the owners of this café. She dreams of continuing her education and to one day become an accountant for the café. Thank you for doing your part so these women can live sustainable, healthier lives! What does 3 tons of potatoes look like? I am very blessed and honored to be a part of this ministry in donating to help so many people! Some girlfriends and I were drawn to this opportunity thru a fabulous awesome concert here in the St. Louis area! I love the whole concept idea “Mocha club” which is so creative, and allows many people to be givers.